Tioman Island Conservation Day 2017 Together For Planet Earth! TIOMAN ISLAND, PAHANG, OCTOBER 2017 – Berjaya Tioman Resort recently held the Tioman Island Conservation Day (TICD) 2017 to restore the beauty of the sea and to preserve the splendid sanctuary of the Tioman Island. The event took place from 20th until 22nd October 2017 with a total of 130 participating divers from Malaysia and Singapore. 30 members of the media and sponsors participated in this year’s TICD to unite together for planet Earth in preserving the nature. Representatives from Reef Check Malaysia, Jabatan Taman Laut and 7 dive operators from Malaysia and Singapore were also present to show their support towards this event. The participants of TICD comprise of both divers and non-divers from all over Malaysia and Singapore. They are all driven by the same passion – care for a sustainable environment. 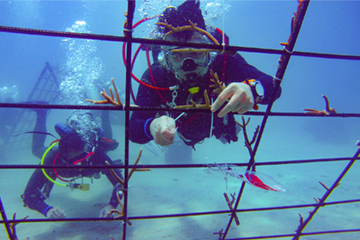 This year, TICD continues to extend this project parameters by providing a bigger area of conducive environment for corals and marine life by submerging 2 units of coral nursery tables and 5 coral structures. These 5 coral structures comprise of 1 pyramid-shaped coral structure, 1 goal post and 3 smaller coral structures. All these coral nursery tables and coral structures were built and submerged underwater to further encourage the growth of coral reefs. As part of the underwater clean-up, the divers also scoured through the ocean floor to remove garbage. As for the non-diver participants, they experienced an extraordinary journey of creating a kinship with the Mother Nature throughout the 3 days 2 nights event. 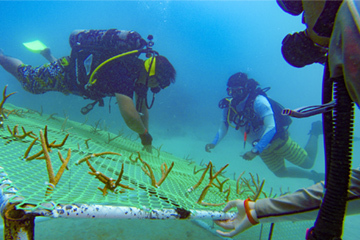 They played an active role in helping out the divers to build the coral structures and coral nursery tables before the divers submerge it underwater to plant the coral. 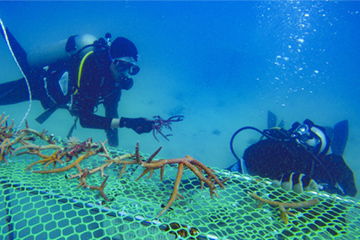 The non-divers also helped out with the land conservation activities such as beach clean-up and tree planting. A total of 40 coconut trees have been planted around the resort’s area. Each year, TICD will have one marine icon to be highlighted throughout the event. This year, the icon is the blue-spotted stingray. We believe that we need to instill the environmental awareness from young as they are the future of the world. In order to create the awareness, Berjaya Tioman Resort shared more with the participating children in the Tioman Island about blue-spotted stingray and why we need to protect them. TICD 2017 has reflected the true meaning of togetherness and teamwork, fuelled by the passion for the environment. 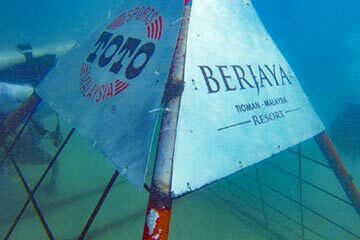 As green-consciousness grows, Berjaya Tioman Resort continues to identify new ways to enhance environmentally-friendly practices and encourage sustainability. Caring for the environment is becoming a vital part of our ‘Legacy of Care’ by Berjaya, instilled by its founder Tan Sri Dato’ Seri Vincent Tan. We are committed to maintain the Tioman Island Conservation Day as part of the corporate social responsibility to give back to the Mother Nature. This event was sponsored by Sports Toto Malaysia Sdn Bhd with generous supports from Cosway Malaysia, Victorinox Swiss Army Timepieces Malaysia, RadioShack Malaysia, Julie’s Biscuits, Kenny Rogers ROASTERS Malaysia, Tourism Malaysia and Cataferry Sdn Bhd.